With this product you can accumulate up to 39 Glitter Points. 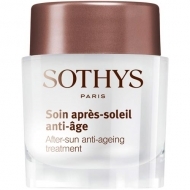 DESCRIPTION: Lait Après-Soleil Corps Régénérant from Sothys is an oily and creamy milk to immediately comfort and sublimate the skin after sun exposure. Active Ingredients: Indian plant extract, which brings the necessary comfort to the skin after exposure to the sun (Boerhavia Diffusa); Association of chaste berry fruit extract and acetyl tyrosine, which act on the synthesis of melanin and promote a radiant and long lasting tan.